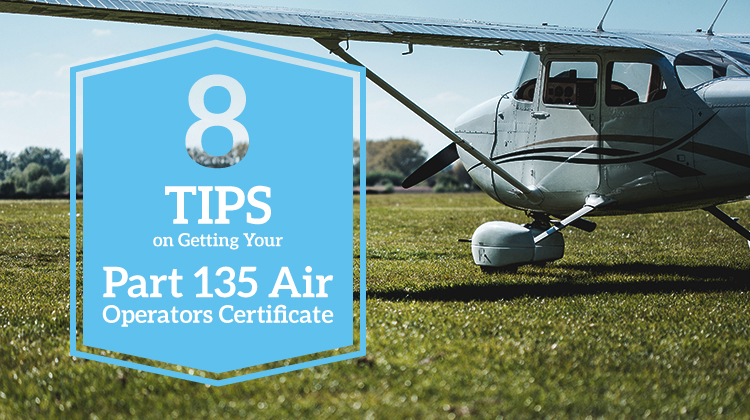 If you’re considering using your aircraft as a commercial “taxi” service, you may not know a lot about how to get your Part 135 Air Operators Certificate. So we put together 8 tips that everyone should keep in mind regarding this topic. What is a Part 135 Air Operators Certificate? If you provide air transportation service for property or for passengers for compensation, then the Federal Aviation Regulations (FAR) require that you obtain a Part 135 Air Operators Certificate. What does the Air Operators Certificate under Part 135 mean for the holder? As a FAR certificate holder, you must comply with certain FAA requirements for flight operations, maintenance, training and other applicable parts of the FARs. The FAA allows the holder of the Air Operators Certificate to pick up passengers at Point A and transport them to Point B for compensation. The FAA also allows the operator to conduct air tours beyond the 25-mile statutory limit set out under the other FARs. Are there different levels of the Air Operators Certificate? Yes. There are three certificates: the single pilot, the single pilot in command, and the basic certificate. If you have the single pilot certificate, then only you (the certificate holder) can fly the air-taxi runs. If you have the single pilot in command certificate, then your plane has more than one pilot during a flight. Both pilots fly the air-taxi run but only one of the pilots is in command at any given time while the other pilot is second in command. At the basic certificate level multiple pilots function as pilots in command on multiple aircraft. How popular are Air Operator Certificates? There are only 4,800 in the entire country, made up of both plane pilots and helicopter pilots. To give you a frame of reference, the FAA says there are 211,619 licensed certified private pilots. So, I’m hooked. How do I get the certificate? Well, we recommend that you work through your local Flight Standards District Office (FSDO) to obtain the certificate. Prepare yourself for a long application process. It has taken some pilots years to get one. The process involves a lot of paperwork. One of the biggest challenges is the Statement of Compliance in which you must list all the applicable FARs and describe how you will comply with their requirements. Are there other practical requirements? Yes. You must provide a drug testing program, prepare a manual regarding whether you will allow HAZMAT on board, and maintain a secure location for your aircraft. You need to maintain perfect maintenance records and pilot logs of flight time. If you will operate your plane in icy conditions, you must also provide a de-icing program and a training module for approval. Isn’t there a list or a checklist of things I need to do and provide to the FSDO? Yes, there is. You can read this Certification Information for Operating Under Part 135. This list contemplates an application for a single pilot certificate. Why does this process take so long? FAA created this process to challenge the pilots who want to attain certification. There are six distinct stages in the process: the pre-application phase, the formal application phase, the document compliance phase, the demonstration and inspection phase, and finally the certification phase. Successful pilots usually complete all phases under guidance from local FSDO staff who are quite knowledgeable about the requirements for the certification. To learn more about the Part 135 industry, read the May 2016 article from aionline.com entitled “FAA Part 135 Study Depicts Industry of Small Businesses.” The study provides a baseline to help quantify the air-taxi contribution to the aviation industry as well as document the effects of agency rules on the air charter segment of the aviation industry. To talk more about this, or anything else, please contact us. We can connect you to passengers interested in air-taxi services all over the world.